Carol Ann Duffy’s Feminine Gospels is truly a work for our generation. Duffy does an amazing job at establishing an overview of both the public and private spheres of men and women. Her take on the patriarchal structure of England really leaves the reader absorbed into this time period much different from our own. Like many of the works that I had the pleasure to read during my stay in London, I truly gained a greater appreciation for Womankind and the struggles many of them have and/or had endured. 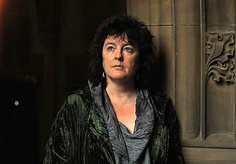 This entry was posted in Carol Ann Duffy by jbstonefreetruth. Bookmark the permalink.